Q? I’m in charge of planning the formal dinner banquet for my family’s reunion next summer. Everyone keeps telling me they want a “nice” event, but I’ve received the banquet menus from the hotel where we’ll be staying, and I’m having “sticker shock” looking at the prices! What can we do to put on a nice event and still keep the cost reasonable for everyone? A! 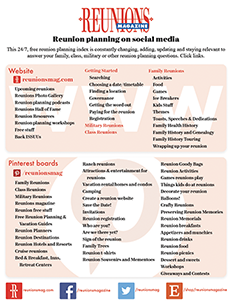 The best time to negotiate banquet pricing is before you sign the hotel contract for your reunion. By including the banquet in your negotiations with the hotel, you increase your leverage and you can “lock in” the maximum price you’ll be paying for your meal. A reunion that includes a banquet is more valuable to the hotel than one that doesn’t. In this case, the family has already confirmed they’ll be using the hotel so the challenge is to work with the hotel to plan an event everyone will enjoy without breaking the bank. Start by contacting the hotel’s catering manager regarding the date and time for your event. If possible, consider having your event on a Sunday afternoon or evening; catering prices at many hotels will be lower on Sunday. Friday and Saturday events tend to be the most expensive, as these are days when the hotel’s banquet rooms are in greatest demand. An afternoon event will almost always be less expensive than an evening event, so you may wish to consider having a formal luncheon rather than dinner. Next, ask the catering manager to work with the hotel’s chef to develop an “in-season” menu. Items which the chef can procure locally and in-season tend to be less expensive than those ordered from across the country. For example, in many parts of the country, strawberry shortcake is a great dessert choice in June (when strawberries are plentiful and inexpensive), but not in February, when strawberries must be imported from California, Arizona or Mexico. Also ask what other groups the hotel will be hosting on your reunion dates, and what they’re serving for their meals. If you can agree to some of the same menu items as other groups, it will result in savings in both the cost of food (the hotel is able to order in greater quantities), and the cost of the preparation (there will be less labor involved in the kitchen). Next, calculate both the number of adults and the number of children who will attend your banquet. Ask to have a separate (lower) per person price for children. If there is a sufficient number of children, the hotel may be able to offer a special “children’s buffet,” with a kid-friendly menu of pizza, chicken fingers and peanut butter sandwiches! If you plan to serve alcohol, consider a cash bar; this way, those who don’t drink will not have to pay for those who do. Or consider offering only beer and wine. And finally, don’t be afraid to give the catering manager your per-person budget and ask for “the very best menu” the hotel is able to offer for that price. This allows the hotel to plan the menu to fit your budget, rather than trying to “guess” what you might be willing to pay. By following these simple steps, you should be able to come up with an enjoyable and affordable meal.